There are many ways of completing this drawing. 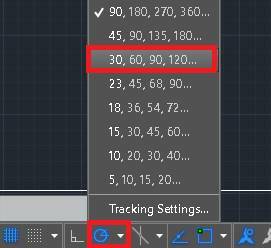 Open your TITLE BLOCK and SAVE AS "Stand"
Right Click on the Polar Tracking tab at the bottom of the screen and set to 30 degress. Draw a 90mm square at 30o for isometric. Then draw the sides down for the base. Draw a line from the midpoint of one line, to the midpoint of the one parallel to it. Draw a 40mm square in the middle of the base – Copy the centerlines over 30 o from the middle to create the square, then trim. From each corner, draw 4, vertical lines and connect the tops of these. Draw the center line for the wedge on the front sides, then copy the centerlines over ½ the thickness of the wedge. Draw base and vertical lines for the wedge – draw them all the way to the other side to make the back wedges. Trim up and add missing lines to finish the Isometric Stand project.